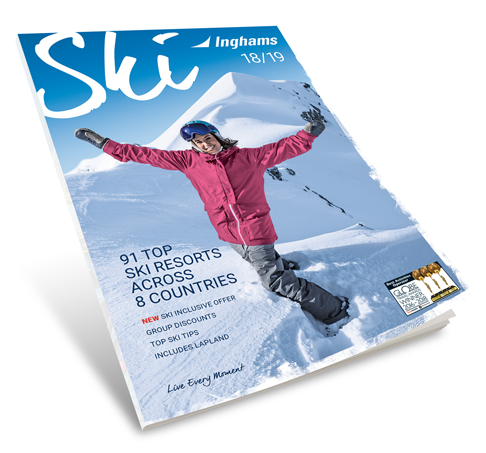 New Inghams Ski & Snowboarding Main Edition 2018/19 brochure. The new brochure offers plenty of choice for the coming winter season, featuring over 90 ski resorts across eight countries and departures from 21 UK regional airports, as well as train travel and self-drive options. These give guests the opportunity to ‘kill two birds with one stone’ and ski some of the country’s finest resorts in one holiday. Options include the Best of Alberta, combining Jasper with Banff, and the Best of Canada, which includes Banff followed by Whistler. The hotel combinations have been especially selected to offer good-quality accommodation in both resorts, whilst creating an excellent-value two week ski break. Stay seven nights at the four-star Caribou Lodge in Banff followed by seven nights at the four-star Crystal Lodge & Suites in Whistler from £1,819 per person based on two sharing. Price includes return flights and all transfers including a domestic flight from Calgary to Vancouver. Visit www.inghams.co.uk/ski or call 01483 791 114. Boasting an expansive (254km), high-altitude ski area served by an impressive lift system, Sölden is an ideal choice for intermediate skiers and snowboarders. Two glaciers ensure a long season with guaranteed snow. Sölden also shares its whole area lift pass with neighbouring Obergurgl, which is only a short bus ride away. Inghams’ popular Meet The Piste service is available here, whereby the Rep provides free ski hosting to help guests discover the area and the best mountain lunch stops. The town’s legendary après ski scene competes with that of St. Anton and Ischgl for Austria’s best party atmosphere. James Bond fans will also recognise Sölden from the 2015 film Spectre and, this winter, a new cinematic experience, 007 Elements, will entertain visitors on the summit of Gaislachkogl. Stay seven nights on half board at the three-star superior Hotel Sölderhof from £839 per person based on two sharing. Price includes return flights and airport transfers. Visit www.inghams.co.uk/ski or call 01483 791 114. Just a convenient, one-hour transfer from Geneva airport, the pretty Savoyard village of La Clusaz is a family-friendly resort with excellent terrain for beginners. The ski area (210km) is formed of five interlinked mountains, which offer a great range of confidence-building green and blue runs. The village itself is chilled out but fun, with plenty of activities: it’s one of the few French resorts where guests can go ski joëring – a rare opportunity to be pulled along by a horse. It’s also renowned for its Full Moon ski events whereby, a couple of times a season, the slopes stay open until 1am for night skiing. Inghams offers self-catering, bed and breakfast and half board accommodation options. A non-ski kindergarten is also available locally. Stay seven nights self-catering at the four-star Résidence Les Grandes Alpes from £599 per person based on eight sharing. Price includes return flights and airport transfers. Visit www.inghams.co.uk/ski or call 01483 791 114. Charming Samoëns is a beautifully-preserved historic village within France’s fourth largest interlinked ski area: the Grand Massif (265km). There couldn’t be a better resort for self-catering guests, as a weekly Savoyard market sells French breads, wines and cheeses, whilst great-value restaurants offer hearty meals and boutique bakeries entice guests in for delicious delicacies. A family lift pass is available (two adults and two children aged five - 15) to pre-book through Inghams from £735, adding value to any family ski holiday. Whilst the skiing is varied and suitable for all levels, there are plenty of non-ski activities too, such as ice-skating, dog sledding, fat biking, hot air balloon rides and yoga classes. Stay seven nights self-catering at the four-star La Reine des Prés Apartments from £509 per person based on ten sharing. Price includes return flights and airport transfers. Visit www.inghams.co.uk/ski or call 01483 791 114. Stylish and sophisticated, Courmayeur (in Aosta Valley) is a favourite with fashionable Italians and boasts iconic skiing (100km) in the shadow of Mont Blanc, best-suited to intermediates. Competent skiers who enjoy off-piste can tackle the famous 22km Vallée Blanche (recommended with a guide) into Chamonix, France, from the top of the ultra-modern Mont Blanc Skyway gondola, which featured prominently in 2017’s spy-flic Kingsman: The Golden Circle, starring Colin Firth. The town’s network of high-end shops and excellent restaurants are linked by pretty cobbled streets, and a thermal spa can be enjoyed after skiing in nearby Pré St. Didier. Stay seven nights on half board at the four-star Hotel Gran Baita from £969 per person based on two sharing. Price includes return flights and airport transfers. Visit www.inghams.co.uk/ski or call 01483 791 114. The Ski Inclusive bundle is a new feature offering discounts for guests who pre-book their lift passes, ski / board and boot hire with Inghams (for all holidays in Europe). Furthermore, Ski Inclusive PLUS Holidays are available in nine hotels, whereby meals and lunches, drinks with dinner, lift passes, ski / board and boot hire are all included*. Stay seven nights at the three-star superior Village Club du Soleil from £749 per person based on two sharing. Price includes return flights, airport transfers, all meals, wine included with dinner, lift pass, ski / board and boot hire. Visit www.inghams.co.uk/ski or call 01483 791 114. Save up to £920 per couple: many hotels offer Inghams guests special early booking discounts (subject to availability). Many partner hotels have great-value offers, often exclusive to Inghams guests, which range from complimentary drinks with dinner or free room upgrades and après-ski snacks, to free activities (such as sleigh rides and tobogganing), discounted hotel spa vouchers and free child supervision / children’s clubs. On many Inghams charter and committed scheduled flights to Europe, and where families are staying in an Inghams chalet, Xtra Chalet, Chalet Hotel or selected ‘Family Choice’ hotel, children aged 2 – 5 can travel for free (subject to availability). Free or half price lift passes, ski school and equipment hire for kids is also available in many resorts. visit www.inghams.co.uk/ski, or call 01483 791 114. Inghams was founded by Walter Ingham in 1934, born out of his enduring passion for ski, mountaineering and walking. In 2014, Inghams celebrated its 80th year and the brand continues to pride itself on being one of the UK's leading, most experienced specialist tour operators, delivering a wide range of award-winning holidays to its loyal guests. Today, Inghams offers winter holidays to over 90 resorts in eight countries, with flights from 21 UK regional airports. It also has a popular Lakes & Mountains summer holiday programme to many European destinations and a dedicated Inghams Italy programme. For more information, visit www.inghams.co.uk.